Gallery of emotions and principles of cosmetic make-up. According to modern concepts and art principles of cosmetic make-up it is considered that features of a face should have open or joyful emotional expressions, but not always such facial image of a woman is correct. Open eyes - excitation of desires. The joyful mouth seems outspoken as eyes and eyebrows express open emotions. The open eyes and eyebrows seem cheerful as the mouth expresses joyful emotions. The person sees and realizes something happy in world around. Desires are reflected in eyes as in a mirror, and the person realizes realization of desires, and consequently feelings are joyful. 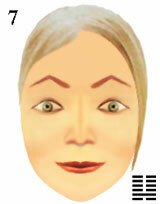 emotional principles of cosmetic make-up for features of a face.